Castle Market has played a big part in Jeff’s life. For the last 20 years, he’s run a hardware business from a couple of units on the lower ground floor of Sheffield’s lively indoor market, which has been under threat of relocation for the past decade. In the late 1980s, Jeff bought the business from Joyce Brammer, the ‘JB’ of JB Tools. Business was so good for the first few years that Cyril, Joyce’s husband, stayed on in the shop to help out. Jeff also employed Sheila (for 16 years, until her retirement), his son Carl and a part-timer. Jeff says “Back then the market was really buzzing. I was constantly bringing in new stock and out sourcing new merchandise”. Business was not his only success at the market. He fell in love with the owner of the haberdashery stall next door. Now she also runs another wool stall across the way, and a card-making / crafts stall on the other side of Jeff. They married 15 years ago and have a son – adding to the three from Jeff’s first marriage. One of these, Tony, has just opened a hardware stall on the floor above. He cuts keys and stocks paint and other stuff his dad doesn’t, and is apparently doing quite well. If Jeff doesn’t have something he’ll send a customer up to his son and vice versa. 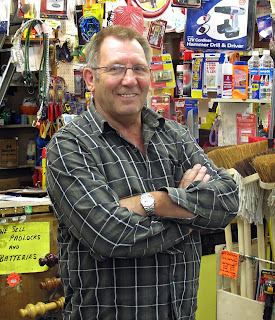 In the long run, if Castle Market does relocate to The Moor, they hope to consolidate into one larger shop with Jeff slowly withdrawing from the business as he nears retirement. The business has slowly declined over 15 years, to the extent that Jeff only employs one part-timer. He cites two main reasons for this. First, it’s the opening of new supermarkets close to the city centre. Each that has opened has taken a percentage of custom away. Before them, customers would come to the market for their fruit, veg, meat, fish, etc., then buy what hardware they needed from him. Secondly, ten years ago, the Council made public their plan to relocate the market to the other side of the city centre. Delays and indecision have led to years of uncertainty for traders, which has accelerated the decline in the market’s fortunes. Because the market might not be there in a few years, new businesses are reluctant to sign up for tenancies. Existing tenants whose contracts are up for renewal are deciding not to renew their lease for the same reason. The Co-op supermarket, which attracts a lot shoppers to the locale, recently decided they won’t commit to 10 more years and will close their store, which will have a negative impact on all the other traders. So as local shops/stalls fall empty there’s no one willing to take them on, except the odd, short-term, transient trader. Also, while the market’s future hangs in the balance, the Council has not invested as much as it could have in maintenance and repairs. The building is slowly disintegrating and would now need millions spent to bring it up to scratch. The state of disrepair means it’s unlikely Jeff’s preference for renovation would be a considered option, as the Council’s plans for the move are reportedly a step closer. He isn’t sure relocation is a good idea, saying that Castle Market is working class, and that customers mostly arrive by bus from the lower income suburbs on Sheffield’s north-side. The proposed relocation to The Moor, on the south side of the city centre, is closer to the more affluent suburbs, where people are more likely to have a car and shop at supermarkets.